We made our way from Mussoorie down to Dehradun for – from what everyone could tell – was an on-time (or only marginally delayed) train departure. Scheduled to depart at 20:30, and the train was only to arrive at 19:10 – but that sort of delay is manageable. Adam and I settled down to wait, with about half an hour to kill, and the train… still not present. This was to be the theme for the evening, as after delays due to fog, the train did not arrive until almost 23:15 – and then didn’t depart until nearly midnight. It was otherwise an uneventful trip, and we secured a prepaid rickshaw from Charbagh (the main railway station) to our homestay, over on Mall Avenue. After settling in (and, admittedly, taking a nap!) 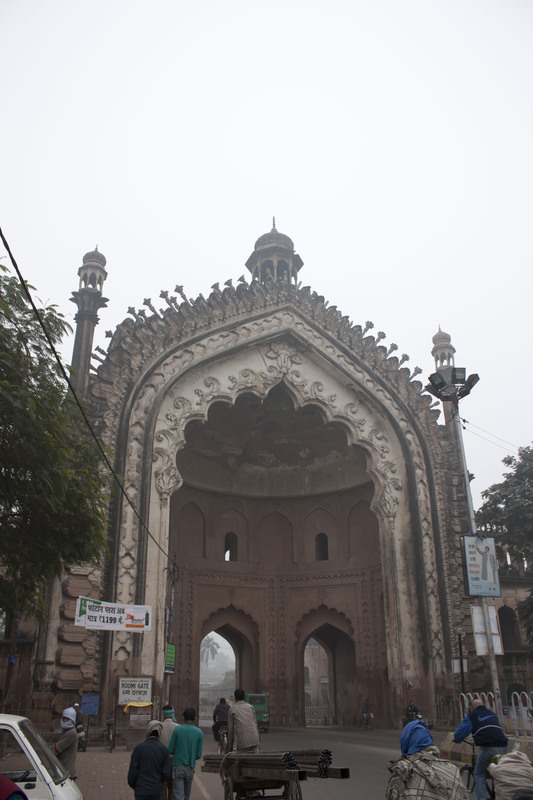 we decided to do some exploring and walked up from our homestay to Hazratganj. Or so we thought, having not brought a copy of a high-detail map in our pockets. We ended up not wanting to walk much more, and decided to stop at the first thing we saw: a Pizza Hut. The service was good, the food was great, and it was noticeably different than the one in Dehradun. We walked back down from the restaurant to our hotel, and made a few notes about travelling in UP: the cycle rickshaw drivers just do not understand “no”, “go away”, “we don’t want one”, in any language. We tried, too, in English and Hindi. The rickshaw drivers are incessant, and the easiest way to avoid them is simply to not make eye contact. Adam called and arranged for the UP Heritage Walking Tour in the morning. 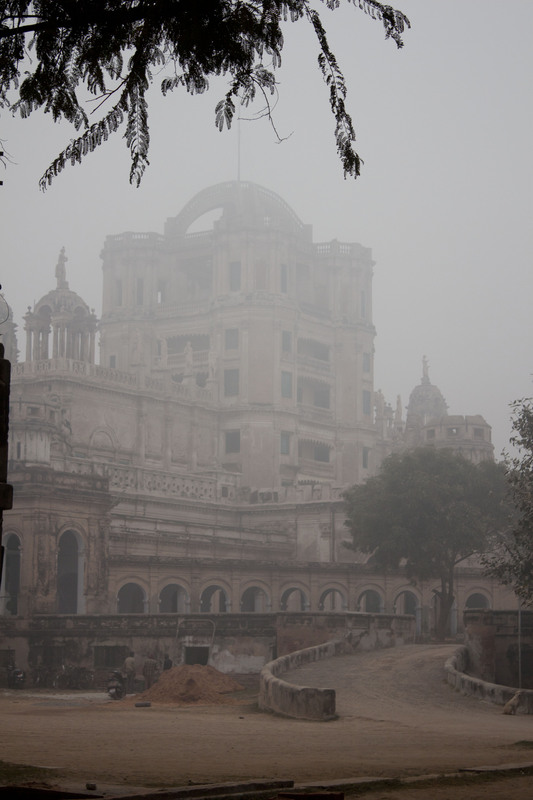 At about 7:15am, we caught a rickshaw – sadly, a cycle rickshaw (no autos in that area) and it took us about 45 minutes to get up to the Imambara, where we were supposed to meet the tour guides. 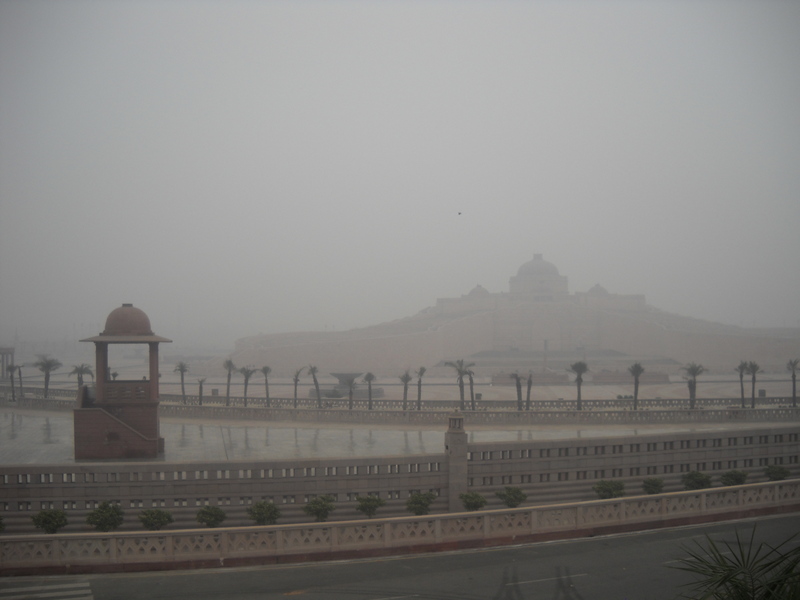 The ride was not bad, but as it was a very chilly and foggy morning, it was a less than wholly enjoyable ride. We also had managed to not get breakfast, and subsequently were cold, a little hungry, and not in the most chipper of moods. There was a little confusion about where we had to meet the guides, but ended up finding them, and proceeded through the tour. We saw a lot of interesting things; the insides of some imambaras, the Rumi Darwaza, the Street of Flowers – both the one behind the Bara Imambara, and the one down in Chowk. 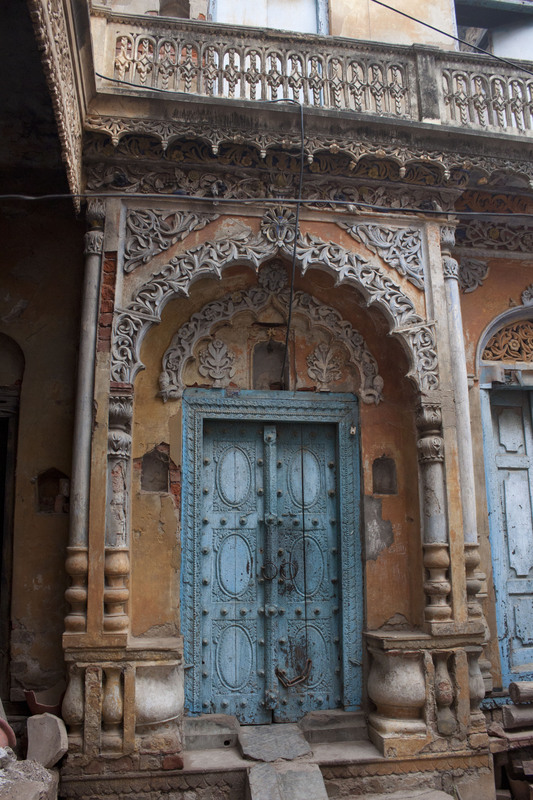 We walked through Chowk/Chandni Chowk, which is one of the oldest parts of the city, and includes things like an Ayurvedic hospital, lots and lots of chikan shops, and a home of some former-royals who had ties to the Indian struggle for Independence. At that home, they have many interesting documents, including letters from Gandhi-ji and others related to the freedom struggle from the British. 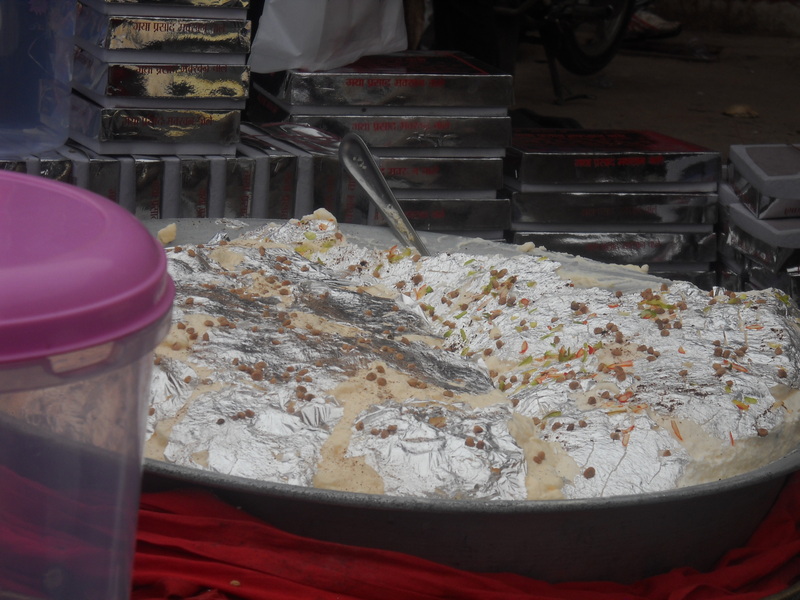 first thing we tried was malaai makkhan (or daulat ki chaat in other parts). It’s fresh cream, whipped to a frothy height, and then flavoured with either cardamom or saffron. The one we sampled was cardamom; it was bedecked with silver foil and pistachios sliced razor thin (we watched them; they really were sliced with a razor). We also stopped at the original Tundey Kebab in Chowk, and paid Rs51 for 3 plates of kebabs and roti. 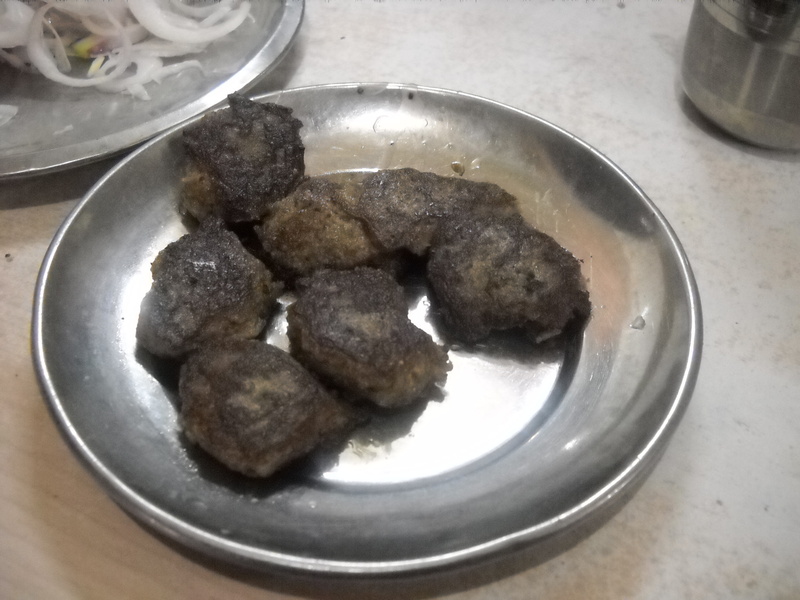 The kebabs were not the Western “shish kebab” of chunks of meat and veg on a skewer; they were patties of absolutely delicious perfectly-spiced meat, crispy on the outside and soft as butter on the inside. Served with roti and sliced raw onions, or sheermal (naan cooked on a tandoor and then covered with a saffron ‘sauce’/coating)… they were absolutely amazing. After we finished our shopping in Chowk, we weren’t sure what to do next, so we decided to go down to Aminabad and go shopping for the various and sundry things that we wanted but didn’t want to pay tourist prices for. When we hailed an autorickshaw, we didn’t have an exact address, but there’s one place in Aminabad every rickshaw driver knows: Tundey Kebab. So we went to a second one. 🙂 We had mutton biryani, roast chicken, and beef(!) kebabs, and Adam was heard to say “This isn’t bad, but the original is better.” I had to laugh at that. It was definitely targeted more to tourists, though; we ended up paying around Rs250 for that larger meal. Still, Rs300 or so for a day’s worth of meals was not bad at all! In Aminabad, it was the usual throng of shoppers; we ended up buying our little Christmas tree there, then nearly having a seizure at the cost of a box of ornaments and decided to get those when we got home. I wasn’t able to find some of the things I wanted, so we ended up just taking a rickshaw back to the homestay and passing out (fairly early) for the night. The third day was more sight-seeing; the owner of the homestay knew a rickshaw driver who would take us on a day-long sightseeing tour for Rs350. We snapped that up, and went out to see a number of sights. The first place we went was La Martiniere College, which was created by a French soldier of fortune and later turned into a boys’ school; it’s a glorious example of palatial French architecture. I’m sad that the weather was as terrible as it was; while atmospheric, it didn’t lend to photography very well. From La Mart we went over and looked at the Ambedkar Memorial, which is the pet project of the UP minister Mayawati (of the Dalits); it’s a memorial park to Dalits, and has suffered no end of monetary issues. I’m sure that it’s quite pretty, but again – awful fog made it less than engaging, and it was also closed so we couldn’t go look round. 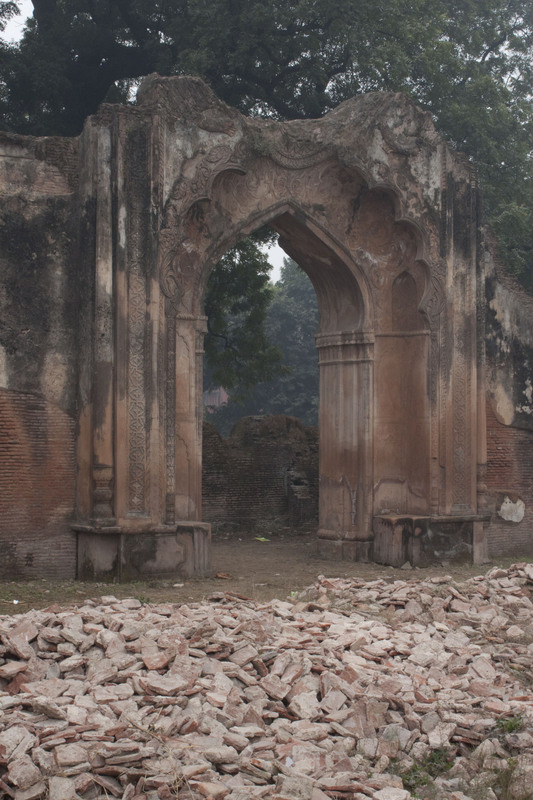 We went to a few Nawab-era tombs and then to the British Residency. The Residency is in (more or less) the same condition it was when it was under siege in 1857 and the first struggle for independence; five months of shelling and gunfire left a number of the buildings in great disrepair, and it’s clear that in some cases, little effort has been made to preserve them. I’m of mixed feelings: the impact of the siege is clear, but there’s graffiti and other damage that has occurred over the years, and the site might be better served with some repair/restoration work. Being able to walk through the buildings is nice, but it also means there’s “AKSHAY LOVES PREETI” scrawled all over the architecture. Adam and I were also clearly the only actual tourists at the site that day: we interrupted at least a dozen couples looking for somewhere to make out, while we explored the grounds. After the Residency, we had Gautam drop us on the Hazratganj and walked up and down it and shopped for a few hours, had late lunch, and then went back to the homestay to get our bag. Turns out the train was delayed a few hours, so we went up to the Cafe Coffee Day and had some coffee before getting a take-away pizza from Pizza Hut, and a rickshaw back down to Charbagh Station. I’m glad we did, too; the train ended up not arriving until nearly 10. 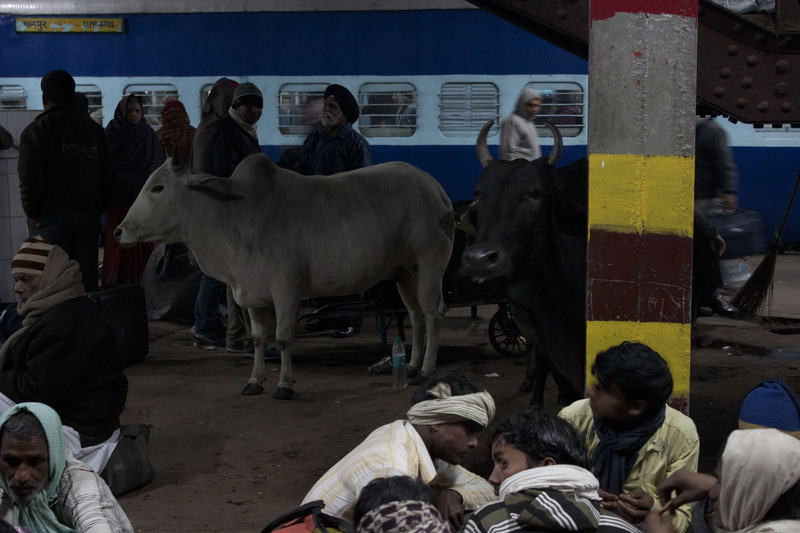 In the mean time, we watched cows wandering around on the platforms, Adam made a new friend (a “brother”, so I became bhabi, or sister-in-law… and his new “brother” had been drinking heavily), and we finally got on the train… and got home nearly 6 hours late! All in all… it was a good trip, and we definitely plan on going back, and extending things: day trips to Kanpur, Ayodhya, properly trawling Aminabad, taking time to really poke and prod at some of the other sites with good knowledgeable guides (La Martiniere when it’s open and we can get a good guide; the labyrinth at Bara Imambara; maybe taking a tonga ride). We used 3 days for this; I’d consider doing it again with 3-4 full days, plus the same (anticipated) early morning arrival, and (anticipated) evening departure.